A major project by renowned Los Angeles artist Doug Aitken will appear next month at Union Station. Described as “a liquid platform for artistic experimentation,” Station to Station: A Nomadic Happening will connect artists, musicians and cultural icons with diverse communities for a series of interventions and site-specific happenings. 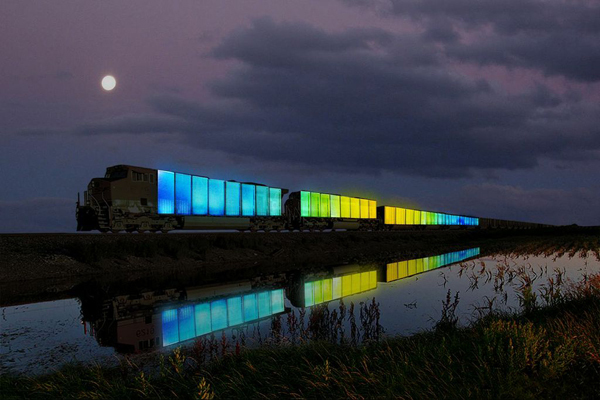 Over the course of three weeks in September, a train will travel from the Atlantic to the Pacific, making nine stops along the way in New York, Pennsylvania, Illinois, Minnesota, New Mexico, Arizona and California, each time for a one-night only live event. The project stops at Union Station on Thursday, September 26 and will feature a concert with performances by Beck, Dan Deacon, Sun Araw & The Congos, No Age, and others to be announced. The $25 concert tickets will go on sale here on Friday, August 9, at noon. 1–Five Nomadic Sculptures created by Kenneth Anger, Urs Fisher, Liz Glynn, Carsten Höller, and Ernesto Neto. The artists were asked to envision a yurt (a portable tent-like dwelling traditionally used by nomads in Central Asia). The Nomadic Sculptures include Höller’s yurt pierced with holes that visitors can throw Frisbees through and Glynn’s creation of the universe that will evolve at each stop. 2–Two yurts designed as intimate gallery-like settings where local artists will be designing and crafting new products in real time. Artists featured include Folk Fibers, Cobra Boots, Chimayo, and Junkyard Jeans. 3–A food yurt featuring a selection of slow food produce. Visit Station to Station for more information about the project. Unless you’re already on the Station to Station train, Union Station is accessible via Metro Rail, Metro Bus and several municipal bus lines. Visit the Trip Planner at metro.net for routes and connections. Bicycle parking is also available on site. Cool, so, where can we see the train itself? Anyone know the route it will take? The rail car decked out in the new design is scheduled to be on the Blue and/or Expo lines next week. Keep your eyes peeled!